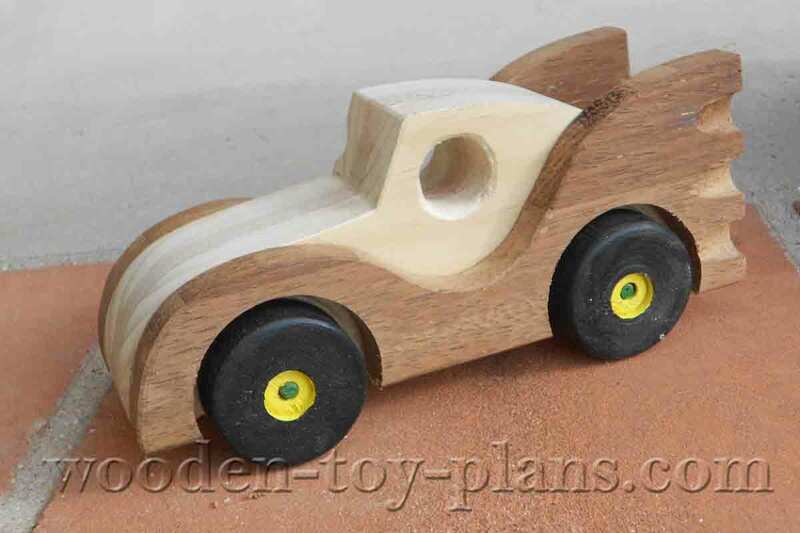 Batmobile Toy Car Plans build your home made toy. Full size templates. 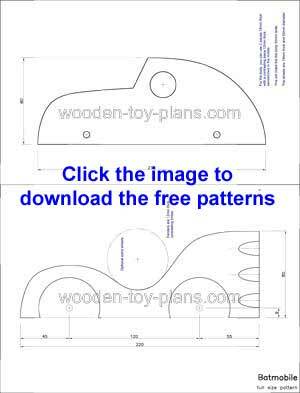 Batmobile toy car to download free full size plans including a step by step building guide with photos. 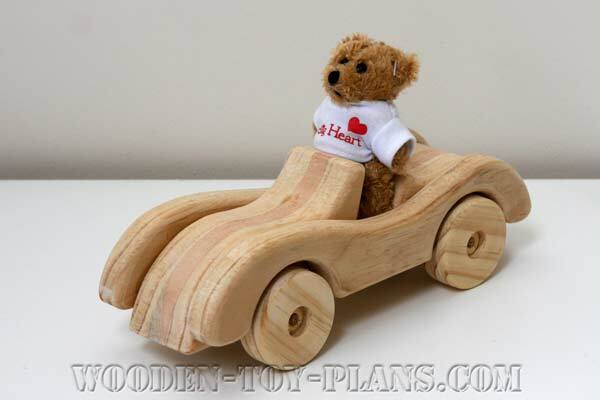 Any scrap wood or recycled timber can be used to make this toy car. To make this one I used pine board about 500mm long and about 95mm wide, with a piece of 12mm thick maple sandwiched in between. The total thickness for the body come to 50mm or 2 inches. The fenders were made from recycled barbecue measuring about the same, but only about 15mm thick. Not sure what wood it is, but it does contrast very well with the pine. 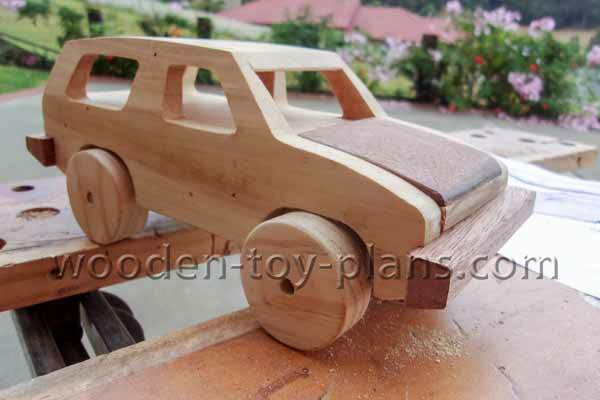 To make this toy, I used a scroll saw and a hole saw to cut out the wheel arches. I used a hole saw of 51mm diameter, which produces a wheel of about 45mm across, a little smaller than commercially available wooden wheels. This is a link to a page on how I use a fly cutter to make my own wheels. 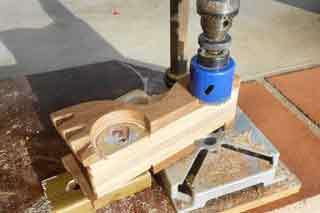 A drill press is an essential for making toys because you need to drill holes accurately. 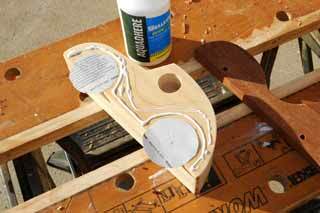 A drum sanding kit is also very useful for sanding inside curves. Paste the full size plans on to a piece of thin card or MDF. Trace the outline on to the workpiece. Showing the outline of the two body halves nose to nose. The idea is to have the end grain forming a V shape in the front. There is even space for two wheels. 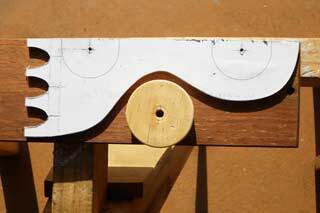 Lay the template onto the work piece to show how the wheel fits. 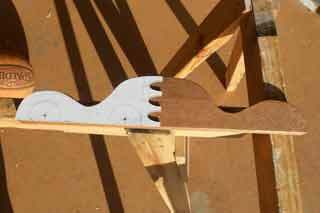 Note the fender shapes are back to back, making it a little easier to cut on the scroll saw. No point in wasting precious wood, even if it is only recycled. Cut out part of the fender pattern. I could use this as a front wheel, or add to my collection of home made wheels. 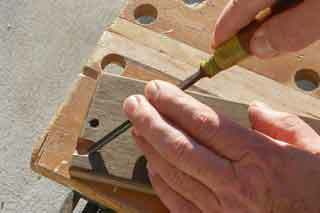 Cut out the rest of the pattern with a scroll saw or band saw. 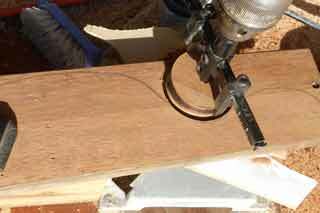 Photo shows a fly cutter, but you could use a hole saw instead. Showing the fenders shape back to back ready to be separated. Mark the holes for the axles with a center punch. Using a carving gouge to shape the flutes. To glue the fenders to the body, use paper discs where the wheel arches are going to be cut out. Using the hole saw to cut out the wheel arch. Showing the fender ready to accept the wooden wheel. The red line shows the groove the cutter has made in the bodywork. 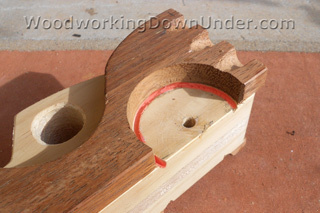 All that remains is to round off the sharp edges and attach the wheels. 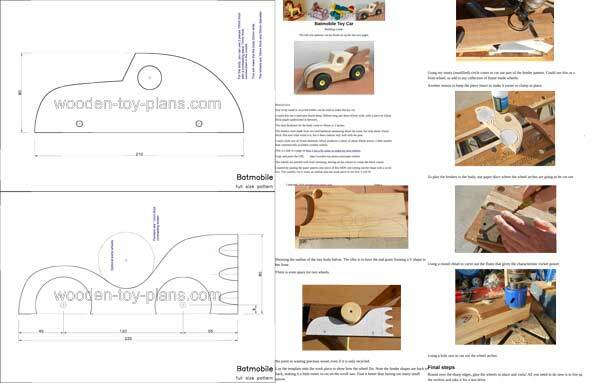 Download the free full size template plans, two separate pages. 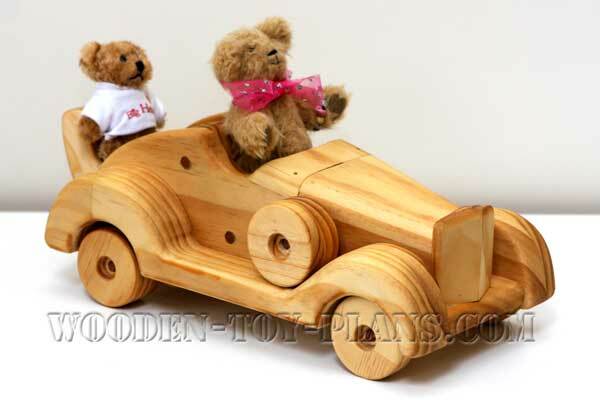 Includes full size template plans and building instructions. More free plans to download. Simply click on the image to go to that page.